My blood started to boil as I sat across from a woman I didn’t know very well. I had mentioned that my oldest child would be in kindergarten in a year and half, and I was contemplating how a shift from daycare to school might change my career path. And I was mad. Really mad. See here’s the deal. My mom stayed at home with me and my brother until I was in the second grade. She taught us, clothed us, bathed us, and was with us every moment of every day. Her full-time job was us. And now as a mother myself, I understand how hard this job was. But she did it with such grace. Then when she went to work outside of the home her job was in the school system and had hours that aligned with ours. My mom worked her TAIL off teaching during the day and then immediately took care of all of our needs right after. Sun up to sun down. I respect my mother immensely. She made a choice to leave a career in retail when I was born. She made a choice to work outside the home in a different industry with a schedule that worked when the time was right for her and our family. Never in one trillion years would I say that she threw her career away. I’ve made different choices so far as a parent. Not better, not worse. Different. When my son was born four years ago I went back to the office three months later. Same plan after my daughter was born 15 months later. 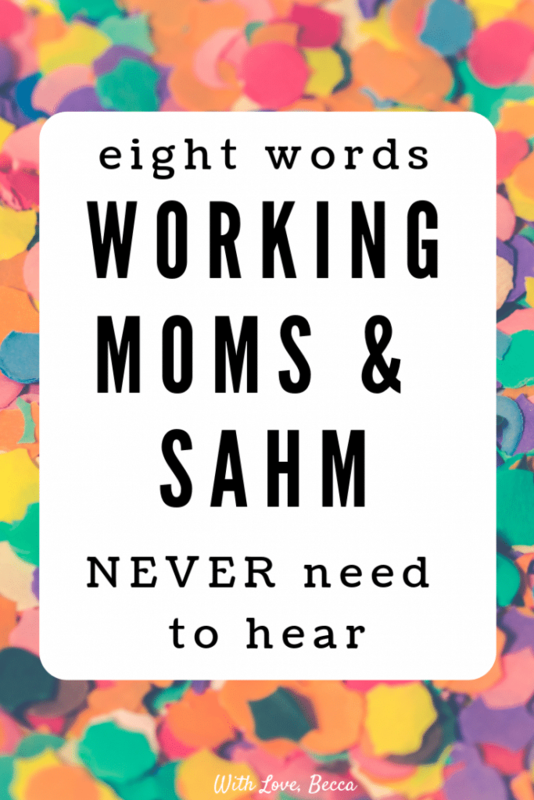 I identify as a “work outside the home” mother and I’m proud of the work I do on a daily basis. But someday I might make a change. Perhaps I’ll work less to accommodate school hours. Maybe I’ll build my own business. Maybe I’ll work more! Or, hold onto your seats, I might stop earning an income all together. I don’t know. You don’t know either really. Life happens. Our interests change. What matters to us can shift and evolve with circumstance, age, and growth. We need to honor that, be flexible, and be true to ourselves. That doesn’t mean throwing anything away. 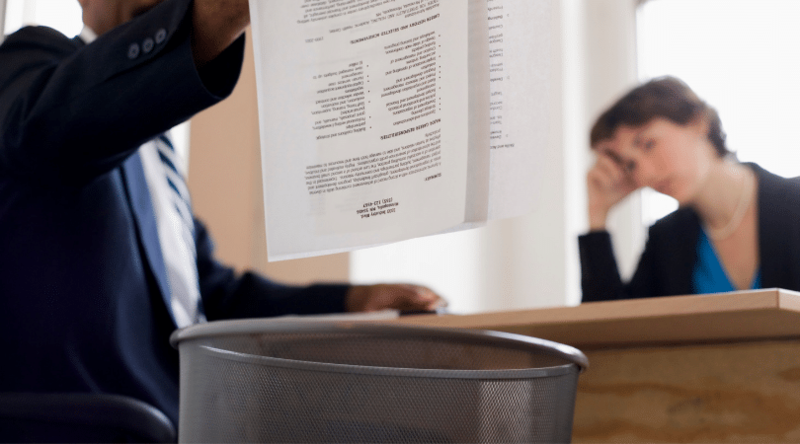 If you are a stay at home parent, do not let anyone tell you that you’ve thrown your career away. If you are a working parent, don’t let anyone tell you that you’ve thrown time with your children away. Am I a little fired about this? YUP. Sure am. But I’m also glad it happened, because it has inspired me to speak louder in my advocacy for your choices as a parent. And to fight for your career path – wherever that takes you. 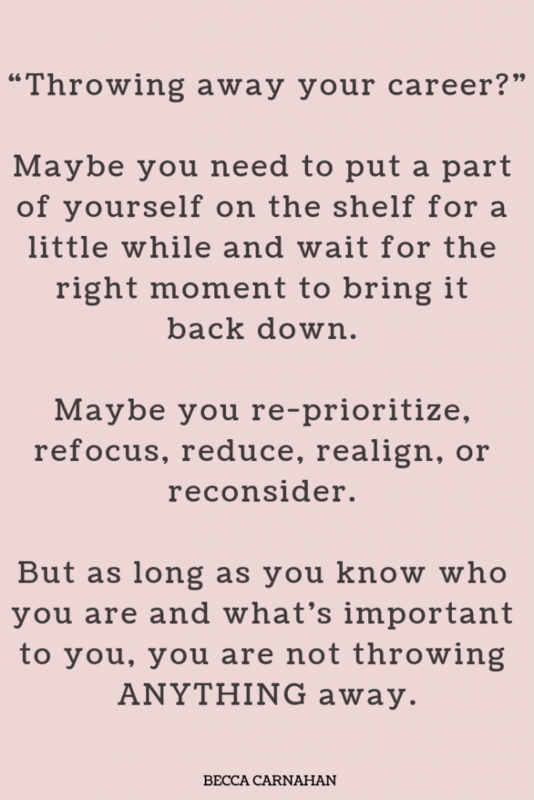 Maybe you need to put a part of yourself on the shelf for a little while and wait for the right moment to bring it back down. Maybe you re-prioritize, refocus, reduce, realign, or reconsider. But as long as you know who you are and what’s important to you, you are not throwing ANYTHING away. For more subscribe to the weekly With Love, Becca newsletter. AMEN. My mom had a very similar path to yours. She was a bookkeeper before she had us and became a teacher when I was around 10. I have a different path than she did, but we are all doing the best we can. Keep it up, lady. Right. Times–and mortgage prices–have changed, and we have to be flexible and willing to change to fit what’s right for our families, right now. I admit to thinking “career waster” but never saying it(!) when I friend, who had been a hospice nurse for years (personally I believe hospice nurses to be angels on Earth) and she wanted to pack it in and start selling makeup and moisturizers to her friends. Thankfully, I said nothing and eventually she found the path that was right for her. She’s studying to be a Nurse Practitioner now. I do think sometimes it’s hard to see people not use all their talents–but that lady jumped to the conclusion that you weren’t going to use all your talents if your career changed. Weird. Anyway, thanks for giving me a lot to think about. Certainly a topic to get fired up about!